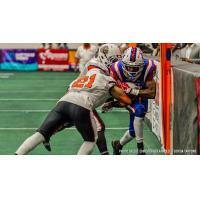 CEDAR RAPIDS, IOWA - The Cedar Rapids River Kings have re-signed defensive lineman Bryce McClain and added receiver John Banks for the 2019 IFL season. McClain, 6'3, 260 pounds, will rejoin Cedar Rapids after being on the team for the 2018 campaign where he started two games and played in five. He recorded tackles against the Nebraska Danger and the Arizona Rattlers while picking up an assist against the Green Bay Blizzard. McClain totaled two tackles and one assist during five games, in a season shortened by injury. McClain got back into football as a player in 2017, joining the IFL with the Colorado Crush. He recorded one tackle for loss and three assists playing in two games that year. As a collegian, he attended Shaw University in Raleigh, North Carolina, where he helped lead the Bears to a CIAA Conference Championship as both a freshman and a junior, in 2008 and 2010. McClain graduated from Phillipsburg High School in Phillipsburg, New Jersey in the spring of 2008. 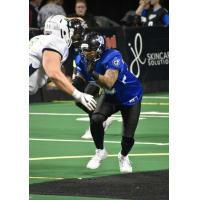 Banks, 5'10", 180 pounds, will join the River Kings for his first IFL season. He most recently spent time with the Florida Tarpons of the American Arena League (AAL) where he saw action ins six games and recorded 35 receptions. He hauled in a total of 11 touchdowns in just three games from scrimmage. Prior to the AAL, Banks spent time on the AFL Tampa Bay Storm's practice squad. He played his collegiate football for the University of Faith in St. Petersburg, Florida.